Hey guys! Today I wanted to do another holiday-themed Manicure Monday and what better excuse to wear a bunch of gold glitter than this? We are just a few short days away from Christmas so I had to represent such a glitzy, iconic nail color. Here I used a combo of China Glaze Passion and Deborah Lippmann Boom Boom Pow to give it that extra sparkle. China Glaze Passion is one of my favorite metallics and is a go-to for stamping on dark nail shades but I thought it would make a perfect base tone beneath Boom Boom Pow. I remember seeing how sparse the glitters were in swatches I had seen before so I didn't want to risk it. True to my expectations, Boom Boom Pow is not the type of glitter polish you'd want to wear alone as the warm, translucent base gives the look of having yellowed nails. Here I wore a base of OPI Nail Envy, 1 coat of China Glaze Passion, 3 coats of Boom Boom Pow, and a top coat of Seche Vite. The result is a festive and sparkling gold nail which isn't the full-on glitter bomb I was hoping for, but still quite pretty. The gold hexagonal glitters especially look like they have a bit of curve to them which makes them glint in the light a little more. Next time, I think I'll try Boom Boom Pow over a solid black to better see the intricacies of this polish. Since gold glitters aren't all that difficult to find, I'm not sure I'd shell out $18 to purchase it full price but it is always a nice option to have this type of gold glitter around to add some extra interest to an otherwise boring manicure. Readers, do you have a favorite gold or gold glitter you can recommend? Do you prefer glitter top coats or full-coverage glitters? Let me know in the comments! Love this colour! Thanks for the tips on applying china glaze as a base! Boom Boom Pow is one of my all-time favorites. I love the sparkle! Love your festive Manicure Mondays as of late! 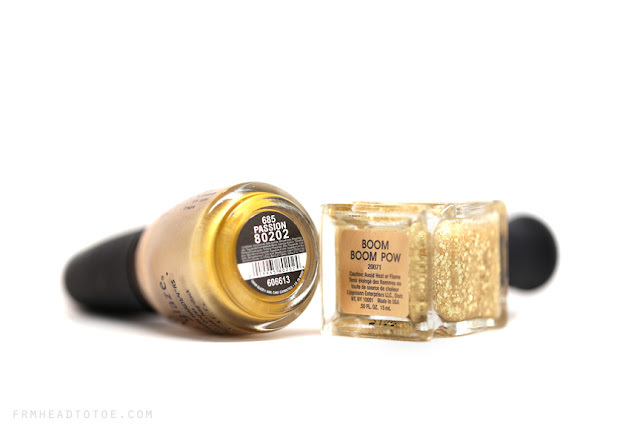 Trying Boom Boom Pow over black is a great idea, as I am curious whether it looks anything like Deborah Lippmann's Cleopatra in New York, which I bought recently but haven't tried! If you Google swatches, it's a gold-glitter-in-black polish, very pretty for the hols! 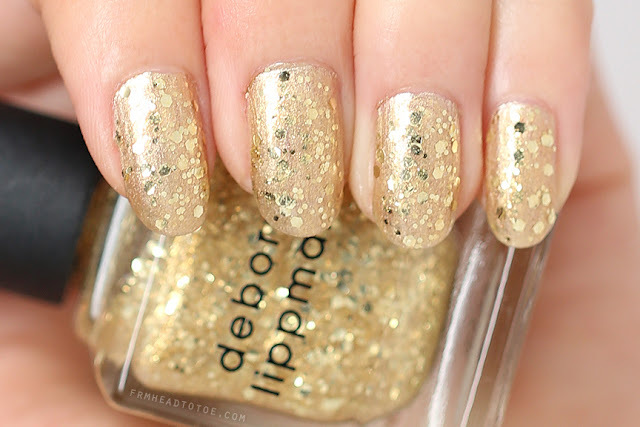 JulieG, a Rite Aid drugstore brand has a gold glitter called Cleopatra's Cobra, might be similar to Boom Boom Pow. 90's Kid Survey with Philip Wang! Interview with Too Faced founder Jarrod Blandino! How To Whiten Teeth & Food Do's & Don'ts!